The discovery of dozens of greyhound racing dogs tormented and left to starve to death after this fall's racing season had ended has angered and appalled law enforcement and humane officials. Thirty-two grossly emaciated dogs have been found dead at a kennel owned by Ebro dog trainer Ronald John Williams. Another five were found alive, three of them severely malnourished, and are being nursed back to health. Food for the dogs was found rotting in a broken freezer and several of the animals were found with duct tape tightly wound around their jaws and necks, said Washington County Sheriff Bobby Haddock. "We don't know if it's a combination of trying to speed up the process or to keep them from barking," he said. The sheriff was shocked at what his officers discovered. "Thirty-two years I've been in law enforcement here locally and with the prosecutor's office also … I've never seen animal cruelty cases like this one," Haddock said. "We hope he rots in prison," said Mark Hess, the assistant manager at the Ebro Greyhound Park in Florida, where the dogs raced this year. Williams was charged with 37 counts of felony animal cruelty and is suspected in an animal cruelty investigation in a neighboring county in which the remains of eight more dogs, believed to be greyhounds, were found dumped under a bridge a half-mile from his Ponce de Leon, Fla., home. Haddock's office is working closely with officials in Walton County to try and tie Williams to the eight dogs found left under a bridge there. Haddock said they're hoping the racing tattoos on the dogs' ears and collars with their names on it will lead to an answer. Greyhound racing has long pitted adoption volunteers against tracks they accuse of mistreating and exploiting the docile animals. The California-based Greyhound Protection League accuses the greyhound racing industry on its Web site of being "responsible for incalculable animal suffering and the routine killing of thousands of young, healthy greyhounds each year." But the president of Greyhound Pets of America, a national greyhound adoption non-profit, takes a more pragmatic approach. "The majority are well taken care of and treated right," Rory Goree said. "My opinion is if they've been abused a lot, it's going to show up in their temperment and I have not seen it show up in their temperment." But Goree admitted that Florida is notorious for having the worst tracks in the country and he called Williams "a bum." "If this guy would have said, 'You take the dogs,' we would have figured out a way to take care of them," Goree said. "There's just no excuse for not even trying." Williams is being held in the Washington County jail on $74,000 bond. He is next due in court Dec. 6, where he will be assigned a public defender if he does not hire a lawyer before then. Hess said he understands the intense scrutiny greyhound racing has come under in recent years. Several states have gone so far as to ban dog racing. But Hess said that his track, family owned for decades, takes pride in the responsibility of keeping his dogs safe. "I have not been able to sleep since this happened," he said. "All I keep thinking is there something in our policies that could have stopped this sooner." Suspicion about Williams' kennel, one of eight Ebro contracts with to train the dogs and house them during the racing season, was raised last month when he brought eight underweight dogs to Ebro's adoption facility looking to unload them. "Those greyhounds were underweight and appeared … to be very unhealthy," Hess said. "Which raised a red flag for us obviously." In collaboration with the local chapter of Greyhound Pets of America, a call was placed to the state's Pari-Mutuel Wagering Division, which regulates gambling in Florida as well as horse and greyhound racing. On Oct. 29, investigators visited Williams' kennel, which Hess called a "horrific scene." Even more frustrating, he said, was that Ebro had given Williams food for the dogs. That food was found rotting in a broken freezer, never given to the dogs. Haddock said it was obvious that some of the greyhounds had been dead for weeks, possibly never fed again after the racing season closed Sept. 25. 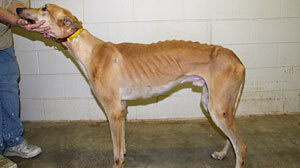 Some were left to rot in their kennels, others had been bagged or put in freezers. The smell just approaching the kennels, he said, "was pretty bad." When officials got to the kennels, Haddock said Williams initially tried to pass off the deaths to a broken air-conditioner, saying he was doing regular checks of the dogs. "Which is hogwash," Haddock said. "These dogs didn't just die and decompose this quick." Though animal lovers have long blasted the criminal justice system for what they consider to be light treatment of even the worst abusers, Haddock said they were ready to throw to the book at Williams. "Thirty-seven counts. The reason we charged him that way, we take this serious," Haddock said. "The reason people raise up in arms over animals and kids is because they're defenseless." Haddock's office has also begun looking into Williams' background, looking both for a motive and for other instances of abuse. They learned he was operating a kennel in Mobile, Ala., Haddock said, but officers there found only healthy animals during a recent welfare check. Williams had been previously disciplined at Ebro, Hess said, but never for anything relating to animal cruelty. He has worked at Ebro for three to four years. Though the kennels are inspected routinely during the racing season, he said, there is little in the way of mandated welfare checks in the off season. It's a discrepancy Hess has vowed to address when he reviews the track's policies. He's also considering installing cameras in the kennels and hopes other tracks in the area will follow suit in tightening their rules. Florida has become somewhat of a dumping ground for greyhounds as a result of their poor performance at more upscale tracks as well as a number of track closings. Goree said Greyhound Pets of America has funneled in as much money as they can to care for the dogs coming off the tracks there, but they are drying up quickly. The Emerald Coast chapter of Greyhound Pets of America, which takes in dogs from the Ebro track, has moved out 700 greyhounds for adoption so far this year, Goree said. He expects the number of greyhounds put up for adoption to begin dropping in the next five or six years, crediting a decrease in the amount of racers bred this year for the first time. "Up until a couple of years ago the racing industry was always breeding well more than 20,000 dogs a year," he said. "This year it only looks like there's going to be between 10,000 and 15,000 bred and trained for racing." Goree attributed track closings in recent years in places like Massachusetts and Connecticut both to awareness of the dogs' treatment and to a general decline in interest. A single track closing can leave as many as 800 dogs being placed with adoption groups or shipped to other tracks. The American Greyhound Council estimated that there are between 35,000 and 40,000 greyhounds racing at 24 tracks nationwide. More than half the tracks are in Florida. Ninety-five percent of retired racers are put up for adoption.